The EU Commission, Parliament and its various organs spent almost €12 BILLION euros (over £10 billion pounds) on ‘administration’, according to the latest EU accounts for 2017. That's the equivalent of the UK's entire annual net contribution to the EU, spent on 'ADMIN' - £10 billion per year. Brexit Facts4EU.Org has been looking at the EU’s latest annual accounts from an overall perspective. We frequently bring you analyses of particular issues but it’s easy to get caught up in the thousands of EU funds and lose sight of the wider picture. Here we present you with a basic fact that you will never get from the BBC, or from any of the other pro-Remain media organisations in the country. We looked at the EU’s official accounts for 2017, at both the budgetary allocations and what was actually committed. Where the money goes is of course highly relevant to the 9 member states who actually make a net payment to the EU. The UK is the second-largest of these ‘net contributors’ after Germany, and these two countries effectively subsidise a large proportion of the EU’s activities. 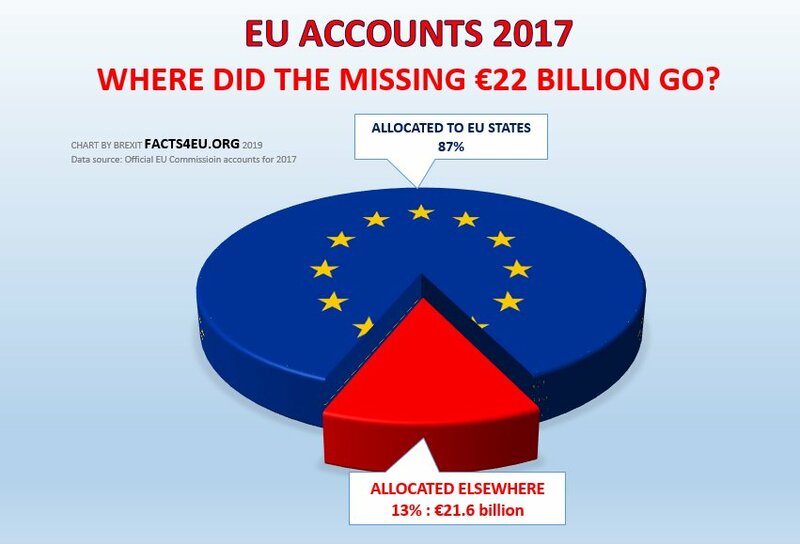 Where did the missing €22 billion in 2017 go? There are two main areas: EU Administration and ‘Global Europe’. This €21.6 billion euros represents over 12.6% of the EU’s voted annual budget for 2017 – the last published set of EU accounts. This is for one year – 2017 and it is typical of previous years. This used to be referred to as ‘The EU in a Global World’ and other such phrases. Now it’s ‘Global Europe’, as the EU never has been lacking in pretensions to its own importance. The above figures relate only to the EU’s official annual budget, not to all its activities outside the EU. It does not cover all of the EU’s spending outside the EU and it does not account for the facts that huge additional sums are also paid through other vehicles. In other words, the picture is in fact worse than the figures in this article suggest. EU taxpayers probably assume that the money they give to the EU via their governments – especially those taxpayers who are resident in net contributor countries such as the UK – is spent in the EU. It may therefore come as a surprise to many that only 87.3% is spent in ways attributable to EU member states. The fact that almost €10 billion of the EU’s basic annual budget is spent outside the EU will come as a surprise to many. In the UK there is currently a hot debate about the 0.7% of GDP which the UK spends on foreign aid. The €10 billion per year being spent by the EU outside its borders amounts to 6.1% of its total adopted budget for 2017. 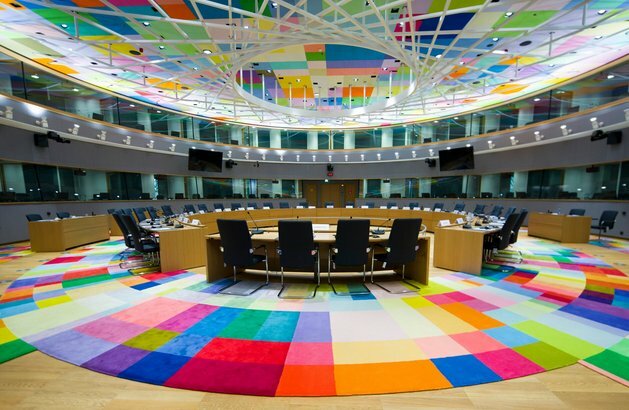 When it comes to the EU administration in Brussels, Strasbourg, Luxembourg and elsewhere, and the cost of funding all those salaries, pensions, limos, wine cellars and the rest, Remoaners may think that almost €12 billion in a year is a bargain. That's £10 billion pounds. It's a sad fact that for decades the BBC and other media organisations have been missing in action when it comes to informing the British public about the true nature of the EU. It is only by constantly researching and highlighting facts like those above that the British people will come to realise the true extent of the deception that has been perpetrated on them for so long. This in turn will help to increase the pressure on Conservative MPs to reject the absurd deal that Mrs May has already agreed, and to eject her from office. Please help to keep us going if you can, with a donation – no matter how small. Our standard caveat: There are so many EU funds – those included in the annual EU budget contributions and those which are not, but into which member states like the UK have to pay – that it’s sometimes difficult to decide which numbers to present to readers. Even in one official EU document it’s possible to find numerous totals where the individual items do not add up, and where a description such as “total payments for the year” are recorded several times as different figures in the same document. What you see above uses official EU figures from the EU’s official accounts for 2017, and is as accurate as we can make it. In any event the sums are so huge that any small disparities are in the nature of rounding errors. You must go because you fail to read and understand the facts, and continue to support, and even promote, the indefensible. Brexit Facts4EU website: Monday, April 15, 2019, 05:23 THE EU SPENT OVER £10 BILLION POUNDS ON ‘ADMIN’ IN 2017 Only 87.3% of the EU 2017 budget was allocated to member states. I would be grateful if you would take the time to read these two articles which clearly demonstrate that you are promoting the indefensible. Excellent letter James Bertram. It would be indefensible not to reply. Please let us know if she does. I think many Remainers still don't understand that there is no such thing as 'EU money'. The EU does not generate money - quite the opposite, it eats up money. (A huge part of it on bureaucracy as your article shows.) It's our Pounds and a few more countries' 'club fees', relabeled with the EU flag. And then there are those Remainers who understand this perfectly well but are very keen to keep quiet about this, as they are enjoying some of our money that's channeled back to them through the EU. Thanks, Patrick, but I expect to get the usual bland response from her assistant. Too, Anne is one of the arch-remainers, recently leading the minister revolt on one of the pro-EU indicative votes - she's basically a lost cause then. Nonetheless, I put it here so it might inspire others to send similar messages to their MPs - to get the information out, so even if they don't change their minds, they cannot say they didn't know the facts. Just checked my letter box - there, a shiny 3 page Conservative leaflet for local elections in Cranleigh - (yes, they delivered before anyone was awake, just in case the dogs were turned on them) - and emblazoned across 3 pages was the Union Jack - not only that, but a large picture of a memorial to 'The Fallen' of our villages! This cynical 'fake patriotism' from a bunch of traitors to win votes is absolutely disgraceful. My family have fought and suffered in both wars, and this hurts. Too, on the parish council voting slip, Conservative (and Liberal) candidates are not showing any party affiliation, but pretending to be independent - not only traitors and hypocrites but cowards too! Too, I now hear the Cabinet want to keep May on until the Autumn, as it suits their scheming ambitions to replace her - Party before Country as usual. Take it from me, I will be voting 'Anyone but Conservative'. JAMES - do as I did with the Government sponsored propaganda to stay in the EU (sent without my permission and with MY money). cut it up into a million pieces and return to sender POSTAGE UNPAID! JAMES, do as I did with the Government sponsored propaganda to stay in the EU (sent without my permission and £9 million of public and MY money) cut it up into a million pieces and return to sender POSTAGE UNPAID! Complaint also fired off to Surrey Advertiser (but now a Remainer Rag and don't print much of my stuff now). Tonight, Notre Dame Cathedral in Paris is aflame. This magnificent Gothic Cathedral has survived countless sieges and wars for over 800 years. This is one of many hundreds of Christian places of worship in France attacked and damaged in the last few years. The desecrations certainly won't be the work of Christians. And yet the Pope still wants to embrace all peoples. His judgement is appallingly simplistic and naïve. This magnificent Gothic cathedral Notre Dame has been the religious inspiration for countless generations of Christians. If this is another case of arson, then let justice prevail. Appreciate this does not relate to the topic in question, yet it has everything to do with getting back control of our borders after a clean Brexit. The French people are our friends, and they deserve so much better in terms of leadership and their own self-determination which can only happen if they too leave the EU. W Alkaway, it would be a revelation and a joyous day to see the eu collapse. Europe does not need a bureaucracy on top of all the parliaments that already existed before the eu. I think it is almost guaranteed the eu will bring closer another war, unless it collapses.